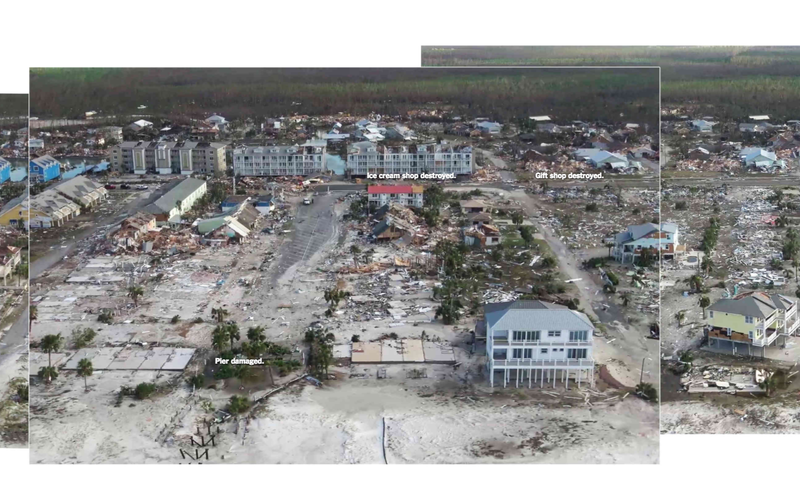 What can we learn from the house that survived Hurricane Michael? 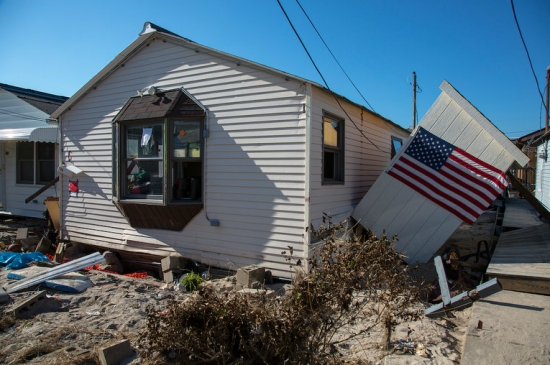 Amidst the destruction wreaked by Hurricane Michael on the 1,200-person town of Mexico Beach, Florida, one house emerged from the 155-mph winds relatively unscathed. As the New York Times reported, the 3-story house built by Dr. Lebron Lackey and his uncle Russell King was the only one remaining on his beachfront block and one of the few left standing in the flattened landscape of the Florida Panhandle town. The house, ironically dubbed the "Sand Castle" and designed by architect Charles A. Gaskin, was completed just this year. Florida windstorm code for this part of the state requires houses to be built for 120-mph winds, but the Sand Castle was designed for 240 to 250-mph winds. The entire house was built on top of 40-foot-tall pilings to allow for storm surge, and its walls are made of poured concrete reinforced by rebar, with steel cables throughout the structure and extra concrete reinforcing the house's corners. Rather than privilege window views, an expected feature of a vacation home, the number of window openings was limited and the roof overhang was minimized, thus reducing the risk of winds lifting the entire roof off. 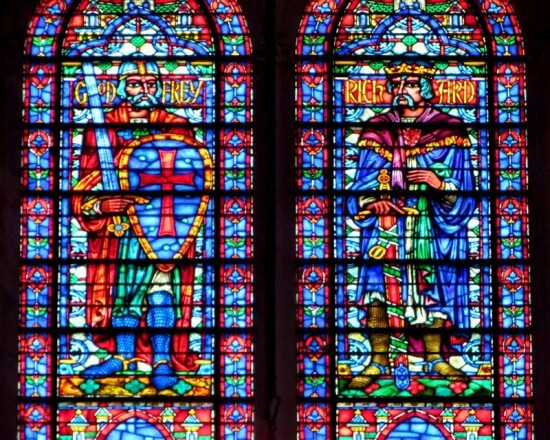 Lackey told CNN that other features that he and his uncle had originally wanted, like a balcony, were also discouraged by their engineer. In the end, the damage sustained by the house was the loss of an outdoor stair, which, along with the siding covering it, was designed to tear off without harming the rest of the building. The ground floor pavers and entryway features were also ripped away, along with a window and a heating unit, and water damage is evident in the building, according to the house's Facebook page. 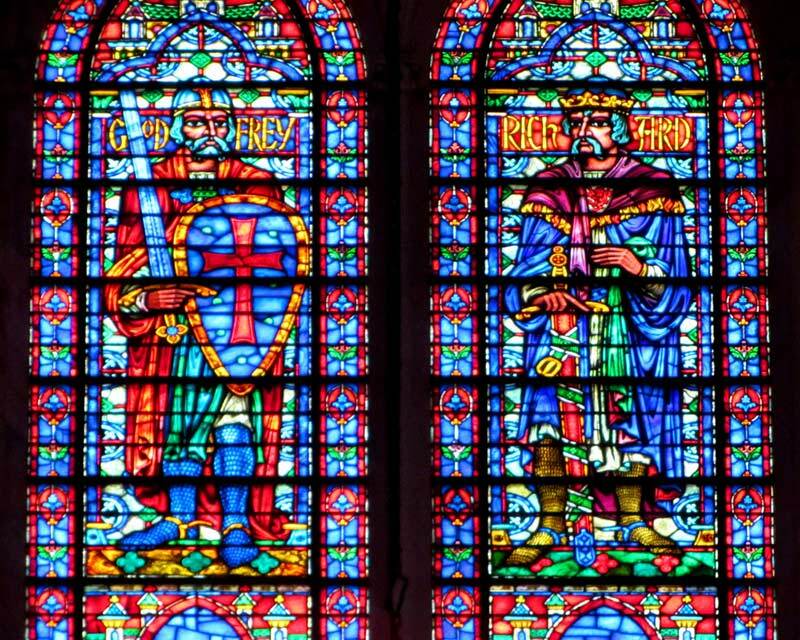 But, as Lackey and King told the Times, these repairs are estimated to take a month. This is far from the case for the rest of the town, which took the hardest hit from the storm and has lost many of its older structures, built before the 2002 code was put into place. Still, for most of Mexico Beach, a largely working-class community, the cost of hurricane-proofing the way that Lackey and King did would have been prohibitive. The measures implemented in the Sand Castle home double the cost of construction per square foot, according to the architect. The quiet town, which has eschewed major waterfront development and prohibited structures taller than five stories, now faces the hard task of rebuilding or making the painful choice to leave the area entirely. The long road to recovery raises the familiar questions that Hurricanes Andrew, Irma, and Harvey have also provoked in recent years. Those who rebuilt after Irma, for instance, have had a hard time finding enough experienced contractors to rebuild to code and local inspectors to check their work, with many still waiting for FEMA assistance and insurance payouts. With FEMA's budget cut by $10 million and transferred to ICE this summer, the path ahead might be even longer. For architects, their role in designing homes that can withstand extreme weather events is perhaps more urgent than ever. Last year, of the roughly 800,000 single-family homes that were built, only 8 percent had concrete frames, a feature that would help them withstand such weather conditions. In ten years, only about 8,000 homes have met the insurance industry standard for a roof that wouldn't leak or tear off during a hurricane. Homeowners may understand the importance of building resilient homes, but the incentive for developers is much lower. Scaling up the innovations for resilient new construction while keeping them affordable is perhaps the field's greatest challenge. What if, instead of washing out, a city could float when it floods? "Our system takes the onus of flood protection off the taxpayer and puts it onto the developer, the owner, and the builder. Why is the public subsidizing irresponsible construction in floodplains when there are better ways to build?" asked Greg Henderson, the founder and CEO of Los Gatos, California–based Arx Pax. The company has developed a new technology to boost resiliency in coastal areas and flood zones by building not on land, but over water. 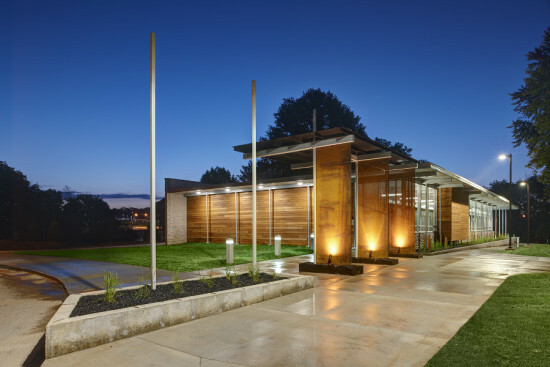 The SAFE Building System is a self-adjusting, three-part floating foundation made of precast concrete pontoons that can support not only homes, but towers and city blocks. Far from an engineer's fantasy, the system has precedent in the Evergreen Point Floating Bridge, which carries Seattle drivers across Lake Washington to the suburbs, and the Mega-Float, the world's largest airport over water in Tokyo, Japan. Though the ambitious system is buoyed by Silicon Valley optimism, the design inspiration for the project is humble. Houseboats, like the ones in Mission Bay that Henderson studied in architecture school at UC Berkeley, are impervious to earthquakes and floods—a solid model of how buildings could float above disaster. Like houseboats, which vary by region and the owner's budget, the SAFE system is replicable but responds to local conditions. At every site, a few feet of water is introduced to float the structures before any floods, like a swimming pool for buildings. The pontoons can be made of myriad materials in response to local conditions; Henderson is adding fly ash and other admixtures to ordinary Portland cement to create pontoons that have a lifespan of hundreds of years. In an explainer video, Arx Pax uses Miami Beach, Florida, as a model to demonstrate how the SAFE system could be implemented.An idea, though, is only as feasible as its permitting. Arx Pax is researching local regulations around the installation and maintenance of in-ground pools for guidance on how to pitch the SAFE system to municipalities. California's Marin County, for example, has rules that govern houseboats, "so there is regulation out there," said Henderson. "We're pushing some envelopes, but we're not doing anything new. We're pulling together existing technologies so it should be easy for people to get behind [the system]." Henderson wants communities—and the federal government—to rethink the reactive approach to disaster planning. The Federal Emergency Management Agency (FEMA)'s rebuild and retreat model, he said, doesn't work when, by some estimates, sea levels could rise more than six feet by 2100. 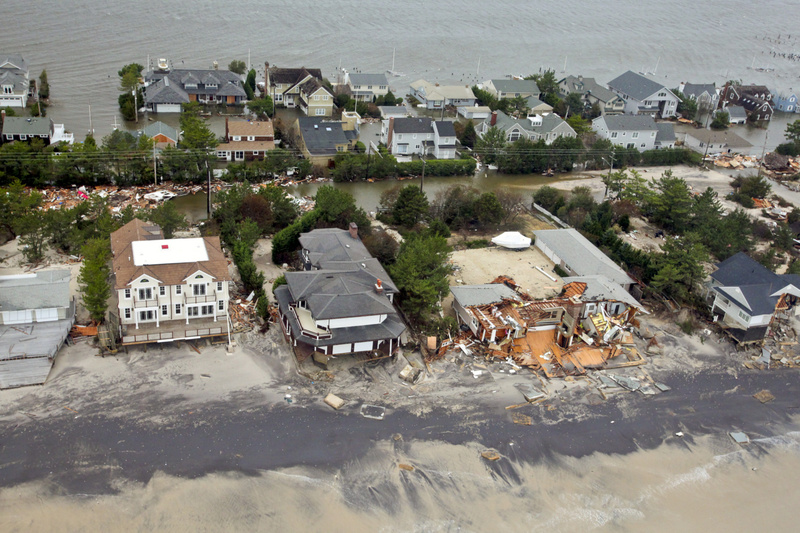 Building on stilts or doing nothing are less cost-effective than the SAFE system long-term, Arx Pax argues, because more frequent extreme weather events will continue to destroy coastlines and cities on floodplains. 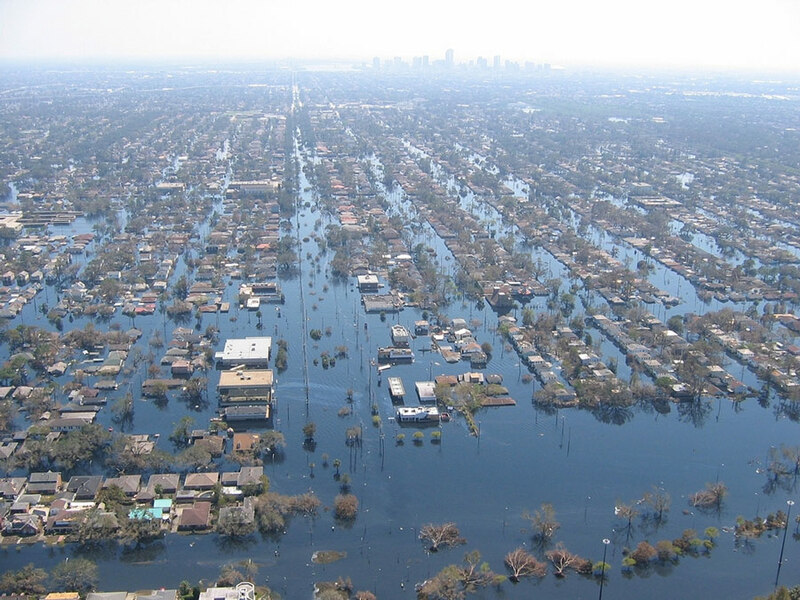 Even levees have problems (beyond breaches): Their slopes take up precious real estate, a proposition that may be feasible in some areas but less desirable in places with high land costs. For cities in climate-change denial, there is still time to reconsider approach to hazard mitigation. Right now, Arx Pax is in talks with FEMA to adopt the technology, and the company is working with a few flood-prone U.S. communities that Henderson declined to name. Internationally, Arx Pax is doing a pilot project with Republic of Kiribati (a small, low-lying island nation in the Pacific Ocean) to increase its resiliency. 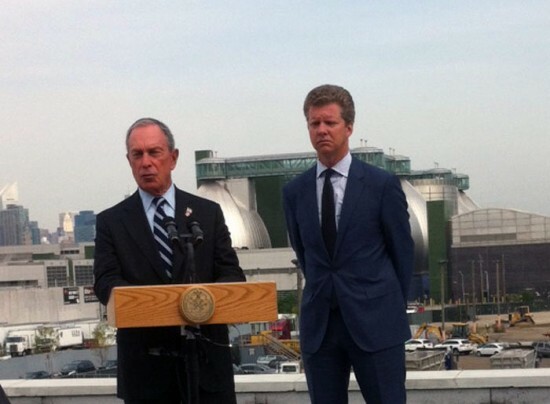 On the roof of a construction site in Greenpoint, Brooklyn Monday, U.S. Department of Housing & Urban Development (HUD) Secretary Shaun Donovan announced the release of a new report outlining 69 rebuilding strategies designed to both help Hurricane Sandy–ravaged communities and to serve as a model for coastal regions across the country that are vulnerable to storm surges and rising sea levels. Close to the waterfront, the site overlooked the Newtown Creek Wastewater Treatment Plant—one of the few sewage treatment facilities to survive Sandy intact. It was a fitting place for Secretary Donovan, who also serves as chair of the Hurricane Sandy Rebuilding Task Force, to introduce this bundle of new recommendations that address both immediate and long-term needs of coastal communities, including resilient and region-wide approaches to rebuilding and infrastructure investment. A number of the initiatives in the report, such as HUD's "Rebuild by Design" competition, are already underway. "And today, less than a year after the storm, we've already provided help to over 250,000 families, and thousands and thousands of businesses across the region," Secretary Donovan said at the announcement. "FEMA alone has provided more than $12 billion of help. But we are not just focused on speeding relief to families and communities, we're also focused on protecting communities from the risks of a changing climate." While the task force has mapped out a range of far-reaching initiatives, it will refrain from dictating how local communities should use those resources. Secretary Donovan recalled that President Barack Obama told him, "No big foot," in one of their first post-Sandy meetings. "And what he meant by that, this is not about the federal government coming in and telling communities what they should build or how they should build. It is about us supporting local visions," Secretary Donovan continued. 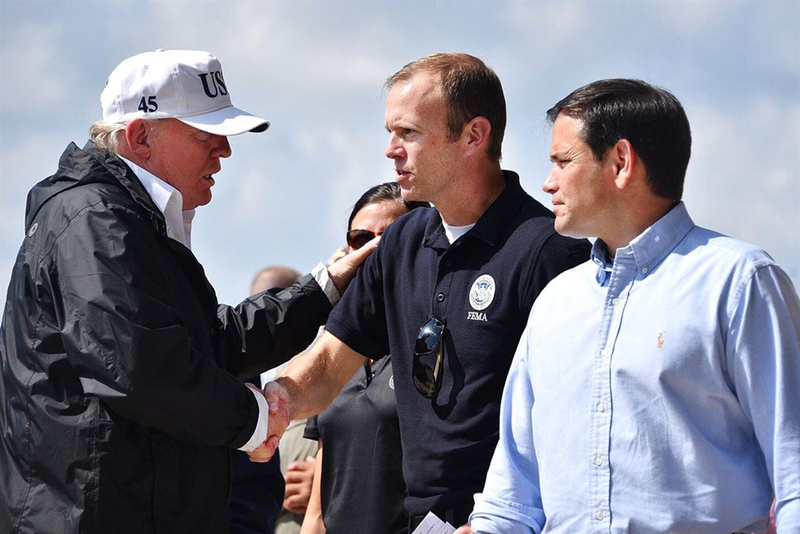 The funding, which is tied to different recommendations in the report, will come from the Disaster Relief Appropriations Act (Sandy Supplemental) and will be allocated and managed by various agencies and federal departments. Secretary Donovan said that the next "tranche" will focus primarily on infrastructure and is to be used at the city's discretion. 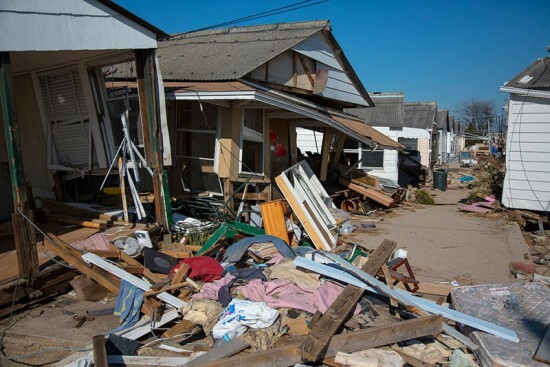 A buyout program will be available to residents who live in coastal areas that are at particularly high risk, but the secretary said that this group makes up a small minority and most waterfront communities will be able to safely rebuild. 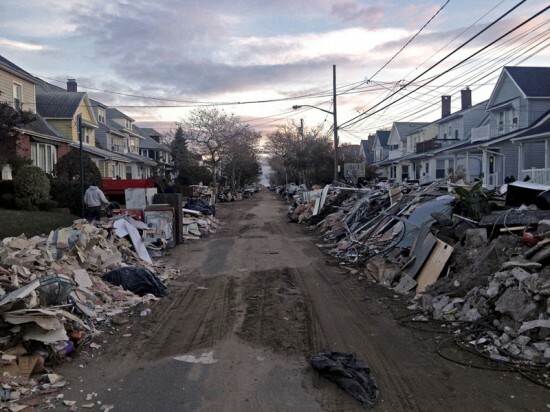 For property owners of Hurricane Sandy-ravaged buildings, the road to recovery just got easier. Starting on Monday, the New York City Department of Buildings (DOB) will offer a new program that provides design consultations to property owners and design professionals who want to reconstruct their buildings. Department officials and technical experts will explain the building code and zoning requirements for properties in special flood hazard areas, as indicated on insurance rate maps or on updated Federal Emergency Management Agency (FEMA) maps. According to the announcement from the DOB: “This program is designed to accelerate the approval process for these projects, assist homeowners with their decisions on reconstruction and better ensure that new flood recommendations and standards are incorporated into the design and construction of these affected buildings." The consultations will be held at the Department’s NYC Development Hub at 80 Centre Street in Manhattan. Property owners will sit down with officials and compile a list of recommendations to apply to the construction plans that they intend on submitting to the DOB. 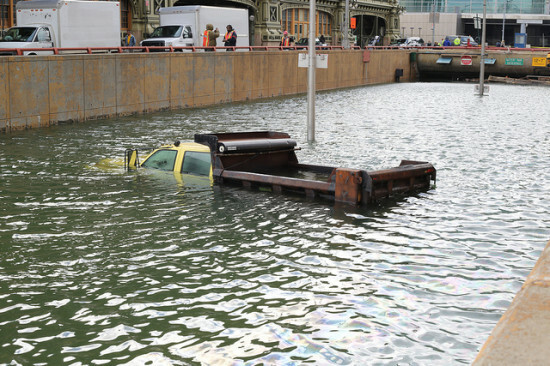 Now that Congress has passed the $51 billion emergency aid package, Mayor Bloomberg is forging ahead with the recovery plans. 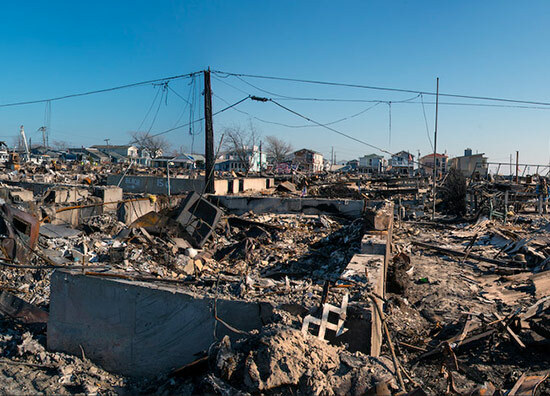 The City will set aside $1.77 billion in federal funds dedicated to rebuilding homes, businesses, public housing and infrastructure that were damaged by Hurricane Sandy. Bloomberg did, however, warn that it could likely take a few months for the programs “to be approved and implemented.” Since the storm, the city, in conjunction with FEMA, has helped homeowners in New York through its Rapid Repairs Program. In a press conference last week, Bloomberg announced that the city will create a $350 grant program to help owners of single-family homes rebuild residences that bore the brunt of the storm, and another $250 million dedicated to “enhance the resiliency” of multi-family housing units. New York City’s public housing sustained considerable damage during the storm, which resulted in up to $785 million in damage to 257 buildings in 32 housing developments. NYCHA will receive $120 million in aid to repair and prepare buildings for future storms by taking measures such as purchasing permanent emergency generators. The city will also provide $100 million in grants to over 1,000 businesses affected by the storm. Businesses will be able to obtain loans of up to $150,000 and grants as large as $60,000. An additional $140 million will be spent on efforts to help build infrastructure for utilities and to jumpstart economic activity in the five business zones that are located in vulnerable areas.